Sec.1: Rd.3: Izzat Dzulkeple (MAS) bt Connor Rabey (GUE) 21-18, Aaron Tennant (IRE) bt Martin Sham (HKC) 21-18, John Fleming (SCO) bt Rob Law (CAN) 21-10, Gariga Babona (PNG) bt Lawrence Paniani (CKI) 21-16, Corey Wedlock (AUS) bt Carlos Tigere (BOT) 21-2. Rd.4: Aaron Teys (AUS) bt Dzulkeple 21-17, Babona bt Fleming 21-10, Tennant bt Tigere 21-20, Wedlock bt Sham21-14, L Paniani bt Law 21-19. Current standings: Wedlock 12 points +49 shots, Teys 9 +21, Babona 6 +9, Tennant 6 +1, L Paniani 6 -2, Dzulkeple 2 -6, Fleming 6 -6, C Rabey 3 -9, Sham 3 -14, Tigere 3 -26, Law 0 -17. Sec.2: Rd.3: Billy Johnson (AUS) bt Lucas Caldwell (CAN) 21-8, Budriz Mustakim (MAS) bt Taiki Paniani (CKI) 21-4, Ross Davis (JER) bt James Po (HKC) 21-17, Sheldon Bagrie-Howley (NZL) bt Nathan Pedersen (AUS) 21-16, Daniel Salmon (WAL) bt Kenneth Ikirima (PNG) 21-8. Rd.4: Bagrie-Howley bt Caldwell 21-5, Johnson bt T Paniani 21-7, Pedersen bt Ikirima 21-6 Mustakim bt Po 21-8, Salmon bt Davis 21-17. Current standings: Mustakim 12 points +39 shots, Bagrie-Howley 12 +26, Salmon 12 +21, Johnson 9 +24, Pedersen 6 +25, Davis 3 -8, Ikirima 3 -28, T Paniani 3 -29, Po 0 -33, Caldwell 0 -37. 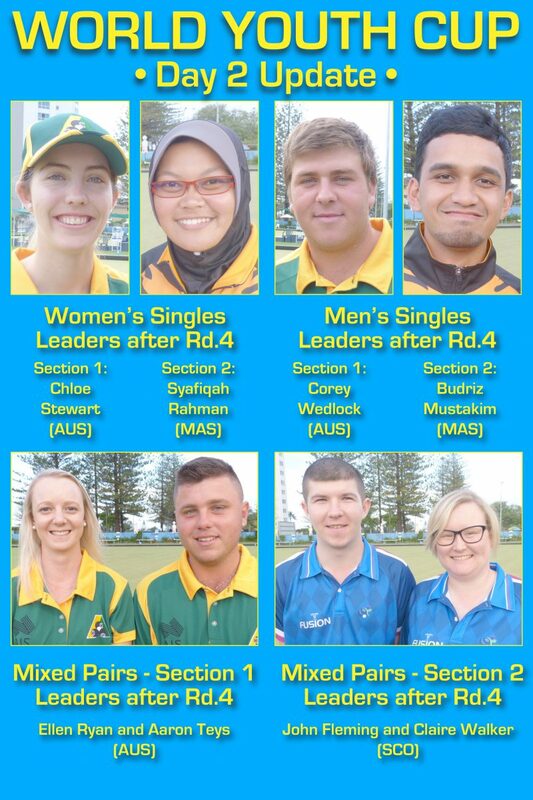 Sec.1: Rd.3: Shae Wilson (NFI) bt Emma Snell (GUE) 21-9, Linda Zakaria (MAS) bt Joey Luk (HKC) 21-8, Chloe Stewart (AUS) bt Lesego Motladiile (BOT) 21-6, Piwen Karkar (PNG) bt Nooroa Mataio (CKI) 21-14, Pricilla Westlake (CAN) bt Ysie White (WAL) 21-10. Rd.4: Kristina Krstic (AUS) bt Wilson 21-18, White bt Karkar 21-7, Stewart bt Zakaria 21-14, Westlake bt Mataio 21-12, Motladiile bt Luk 21-8. Current standings: Stewart 12 points +56 shots, Westlake 9 +31, Wilson 9 +24, Krstic 9 +14, Zakaria 6 +19, Motladiile 6 -3, Mataio 3 -10, White 3 -12, Karkar 3 -31, Snell 0 -42, Luk 0 -46. Sec.2: Rd.3: Tiffany Brodie (AUS) bt Claire Walker (SCO) 21-13, Syafiqah Rahman (MAS) bt Colleen Paniani (CKI) 21-0, Angel So (HKC) bt Sophie Rabey (GUE) 21-4, Connie Rixon (MLT) bt Nicole LeBlanc (CAN) 21-17, Tayla Bruce (NZL) bt Ellen Ryan (AUS) 21-17. Rd.4: Bruce bt LeBlanc 21-3, Ryan bt Brodie 21-6, Rixon bt C Paniani 21-8, Rahman bt Rabey 21-8, Walker bt So 21-5. Current standings: Rahman 12 points +53, Bruce 9 +32, Ryan 9 +22, Rixon 9 +18, Brodie 9 +14, Walker 6 +18, So 6 +8, Rabey 0 -52, LeBlanc 0 -52, C Paniani 0 -58. Sec.1: Rd.3: Tayla Bruce, Sheldon Bagrie-Howley (NZL) bt Linda Zakaria, Izzat Dzulkeple (MAS) 16-15, Tiffany Brodie (AUS), Kenneth Ikirima (PNG) bt Emma Snell, Connor Rabey (GUE) 15-10, Nicole LeBlanc, Rob Law (CAN) bt Ellen Ryan, Aaron Teys (AUS) 12-10, Ysie White, Daniel Salmon (WAL) bt Nooroa Mataio, Taiki Paniani (CKI) 20-10, Shae Wilson (NZL), Aaron Tennant (IRE) bt Joey Luk, Martin Sham (HKC) 15-10. Rd.4: Lesego Motladiile, Carlos Tigere (BOT) bt Bruce, Bagrie-Howley 11-5, White, Salmon bt Brodie, Ikirima 14-7, Mataio, T Paniani bt Snell, C Rabey 16-14, Ryan, Teys bt Wilson, Tennant 20-7, Luk, Sham bt LeBlanc, Law 19-7. Current standings: Ryan, Teys 9 points +25 shots, Bruce, Bagrie-Howley 9 Sq, Luk, Sham 6 +10, White, Salmon 6 +1, Motladiile, Tigere 6 +1, Wilson, Tennant 6 -7, Mataio, T Paniani 6 -10, Zakaria, Dzulkeple 3 Sq, Snell, C Rabey 3 -3, Brodie, Ikirima 3 -5, LeBlanc, Rob Law 3 -12. Sec.2: Rd.3: Pricilla Westlake, Lucas Caldwell (CAN) bt Angel So, James Po (HKC) 16-12, Kristina Krstic, Nathan Pedersen (AUS) bt Syafiqah Rahman, Budriz Mustakin (MAS) 12-11, Sophie Rabey (GUE), Ross Davis (JER) bt Colleen Paniani, Lawrence Paniani (CKI) 18-10, Claire Walker, John Fleming (SCO) bt Piwen Karkar, Gariga Babona (PNG) 14-9, Chloe Stewart, Corey Wedlock (AUS) bt Connie Rixon (MLT), Billy Johnson (AUS) 19-9. Rd.4: Krstic, Pedersen bt Rixon, Johnson 21-6, Walker, Fleming bt S Rabey, Davis 23-3, C Paniani, L Paniani drew So, Po 16-16, Westlake, Caldwell bt Rahman, Mustakin 15-14, Stewart, Wedlock bt Karkar, Babona 31-10. Current standings: Walker, Fleming 12 points +38 shots, Krstic, Pedersen 12 +25, Westlake, Caldwell 9 +7, Stewart, Wedlock 6 +27, Rahman, Mustakin 6 +8, Rixon, Johnson 6 -12, So, Po 4 +9, S Rabey, Davis 3 -40, C Paniani, L Paniani 1 -27, Karkar, Babona 0 -35.